Waseem Kalaro explained the process of producing orchards. Farmers were briefed about the importance of wind mills at AZRI. Waseem Kalaro briefing the farmers about the different species of cactus. 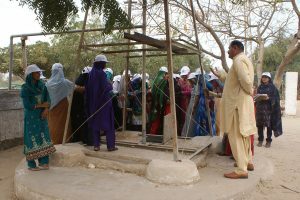 The women farmers from Badin exploring the Pitcher Irrigation Unit at AZRI. the visiting farmers (men) from Badin with the Director and Senior Scientific Officer of AZRI on 26th February, 2018. 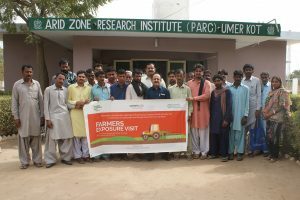 Dr. Atta Ullah, Director and Muhammad Waseem Kalaro, Senior Scientific Officer at AZRI, welcoming and briefing participants visiting the Arid Zone Research Institute. 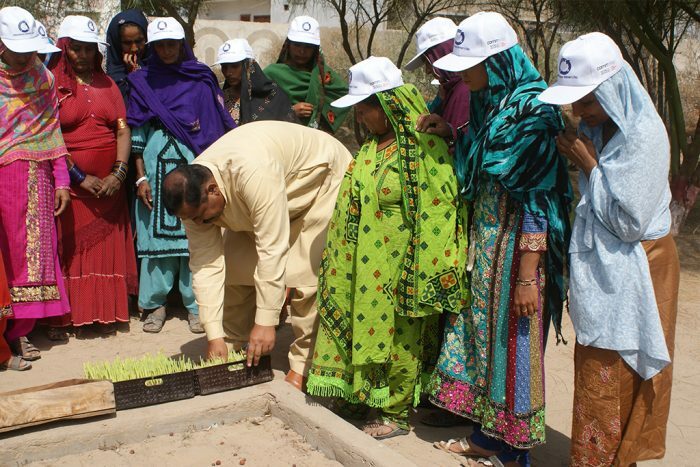 Under the Food Securityproject initiated in Badin, Sindh in 2015, continuous technical support and business development services are provided to rural farmers to achieve high quality agricultural production in order to promote agri-based enterprises. 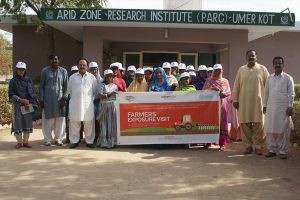 To further strengthen the skills and expertise of these agrarian communities, an exposure visit to the Arid Zone Research Institute (AZRI) in Umerkot was organized in the last week of February this year. The visit was conducted in three groups, one day allocated to each group. 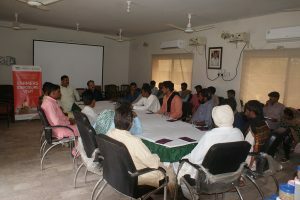 Sixty farmers, nineteen men and forty-three women, from three Union Councils (UC) of Badin participated in the visit. Project staff and AZRI officials facilitated the visit. Dr. Atta Ullah, Director AZRI, welcomed each group at the start of their exposure visit and briefed them on the importance of sustainable agriculture and the various methods they will be exploring at the institute. At the AZRI, the farmers observed many ongoing researches and activities underway. Some of these included kitchen gardening activities using the drip irrigation system, pitcher gardening schemes, solar desalination units and hydroponic cultivation systems. The Drip Irrigation System and ways of cultivating vegetables using this system was explained to the farmers. This irrigation method was introduced during a time of water scarcity in the area. It was through this system that 70 percent of the water was saved at the time. Many vegetables, namely tomato, garlic, onion, spinach and coriander are cultivated through this technique. Farmers learnt how saline water is converted into drinking water using the Solar Desalination Unit at the institute. Eight liters of saline water is converted into drinking water each day, making this technology highly useful in area that lack clean water. Hydroponic cultivation was a completely new innovation for me as I never knew such a quick way of growing nutritious fodder like maize, wheat and oat for animals even existed. I plan to implement this new technique of farming when i return to my lands. Other units such as the Bio fertilizer Mill and Compost Making, Drip irrigation for the Crafted Jujube Orchard and Bio Remediation System where wastewater is treated and used for irrigation purposes were also shown in detail to the farmers’ group. They were sensitized on the use of biofertilizers as one of the most important components of integrated nutrient management, being cost effective as well as being a renewable source of nutrients to supplement chemical fertilizers. Plantations of date palm, agro forestry of arid trees, nursery garden of different grasses, shrubs & trees were also shown to the farmers during their visit. 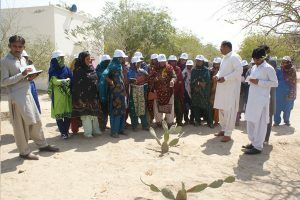 Staff at the AZRI encouraged the farmers from Badin to adopt agricultural practices that use less water as Badin is facing a major scarcity of irrigation water. They further advocated the growing of crops and orchards which require less water. The farmers were enriched with learning new techniques of farming including drip irrigation, drought resistant plants and development of fodders by the end of the exposure visit. It was amazing to see such a large variety of fodder that can be grown with limited use of water. This is highly beneficial for farmers like us who reside in water scarce areas. I have also been provided with some seeds which I will grow on my field. In addition, I will share my learning with other farmers in my village so that everyone can benefit from these new techniques of sustainable farming. 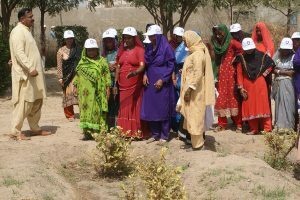 Promoting Sustainable Agriculture Practices to Improve Food Security and Livelihoods of Vulnerable and Marginalized Farmers of Badin Project implemented by Community World Service Asia. The project is co-funded the Canadian Foodgrains Bank (CFGB) and Presbyterian World Service & Development (PWS&D). Special thanks to the government of Canada for supporting this project.